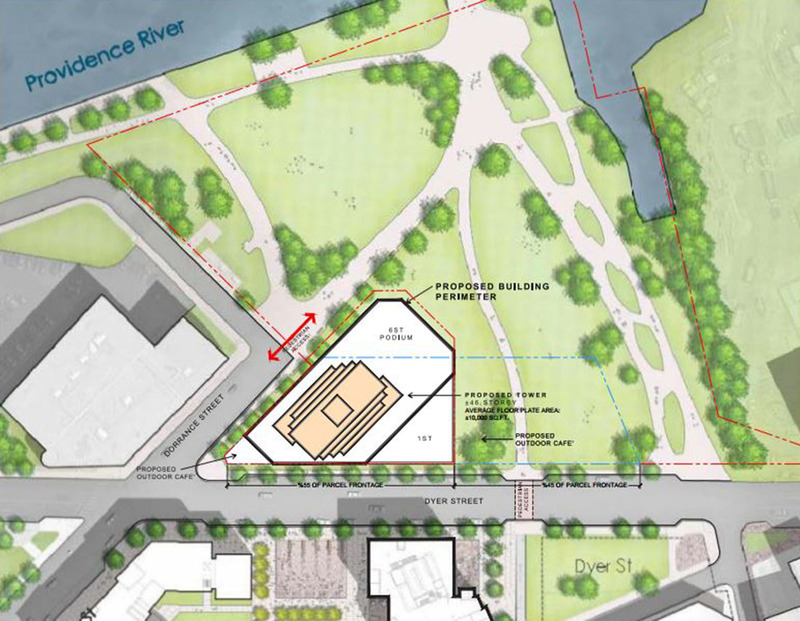 The I-195 Redevelopment District Commission on Wednesday approved a non-binding agreement that sets the parameters for Jason Fane to purchase Parcel 42, a site near the Providence River that he wants to develop into a luxury residential tower. The project, called Hope Point Tower, would include a building of up to 46 stories, divided into condos and apartments. The design is being reworked, and will not resemble the images released earlier in 2017. What Fane wants to build, he told reporters following the meeting, is an iconic building that will redefine Providence. He did not release a rendering. The project is expected to be valued at $250 million, he said. In order to purchase the land and build his tower, Fane, president of the New York-based Fane Organization, will have to obtain a series of approvals from city authorities, including the design of the structure and a zoning change that would authorize its height. The site is in a zone that caps building heights at 130 feet. It is good that the tower is going into redesign, I hope they remove all the damn brick. 46-story buidlings are not made of brick, it is silly and fake to do that. If the project moves forward, the design will eventually be reviewed by the Downtown Design Review Committee. Now that the land is being sold to Fane, the likelihood that this project gets done increases. It’s a great thing for the City! I believe that the Providence skyline will fill in between the Hope Point Tower and the current financial district…the value of those surface parking lots just increased and they are no longer on the fringe of the City. Also, by increasing the height restriction on Hope Point, those lots will fit better with taller high-rises thus creating more lots that can be aesthetically appropriate for a One Westminster type skyscraper. To think that there are 3,000 apartments (and 5 hotels) planned or under construction for downtown Providence is so exciting. We will eventually hit the critical mass where vibrant downtown community is sustainable 7 days per week, not just weekends. With these new residents, the City is going to need some new entertainment options (cough, New England Revolution stadium, cough). I still see a real lack of effort from the City and State to market Providence as an alternative to Boston. The Amtrak is only 35 minutes between the two cities and the cost savings can be significant. If they do want to build more mid-rises by Providence Station, then they need to start a marketing campaign to spread awareness of how travel between the two cities is not a hassle. I find it hard to believe that there are not a few thousand Bostonians that would prefer to live in Providence and commute into work. That’s all it would take to fill up the proposed mid-rises around the station on the base of Capitol Hill. One more step in the right direction. Now, all supporters need to show up or communicate to the City Council once Fane puts his package in front of them. As to the zoning heights in the area of this parcel, they are shockingly low. I find it small town, provincial, and damaging to the growth of downtown. Only 1/3 of a mile south of Parcel 42 are THREE smokestacks the height of 25 story (over 250 feet) buildings and yet the zoning in the area of this parcel is in the 100 foot range! The city should triple the height (300 feet) with a 150 foot variance all through the Innovation District. This is Providence – not Portsmouth. What do people think about this building’s potential to soak up perhaps all of the demand for luxury housing in the downtown area? Would that chill the market to develop the other 195 plots if this one has such a massive number of potential units? I’m thinking about how long those Waterplace units went unsold way back when, though those had the worst timing with the downturn. Could that mean other developers can then make middle-income units work for their bottom line, or just that other plots could stay empty until the market can handle more luxury units? I just wonder if concentrating so much development on one site could keep others from renovating/adapting/getting built through the city and whether that’s a good or bad thing. The development around this site should help fill that building. This is great news. Now when does the official purchasing happen? Is it before the zoning? Bargain! Now one is talking about what will happen with the Brown property across the street. 25 years ago a student of mine (Andrew Grace – now working for BRA) proposed towers framing the axis of Dorrance street. This would give the Down City a real thrust and connection to the river and the bay beyond. This plan would allow such a possibility to emerge – very cool. Not sure about a white tower, but brick is not the answer! Design review process in Providence is typically geared toward preservation concerns. Not sure it is up to the task in this case. I’m also interested how this will impact local real estate, specifically downtown units, and housing development on other 195 parcels. Overall I think it’s a good thing, and long term will help to develop the area and drive things forward. I do think in the short term it may over-saturate the market for high end housing and probably take a while to fill, especially if other 195 land development lags. Though housing demand is heavily outweighing supply right now, so as long as that holds they’ll probably be fine.